The Office of the National Coordinator for Health IT (ONC) has a responsibility to coordinate across the federal partners to achieve a shared set of priorities and approach to health IT. To that end, today we released the draft Federal Health IT Strategic Plan 2015-2020, and we are seeking feedback on the federal health IT strategy. This Strategic Plan represents the collective priorities of federal agencies for modernizing our health ecosystem; however, we need your input. We will accept public comment through February 6, 2015. Please offer your insights on how we can improve our strategy and ensure that it reflects our nation’s most important needs. A collection of 35-plus federal departments and agencies collaborated to develop the draft Federal Health IT Strategic Plan: 2015-2020, identifying key federal health IT priorities for the next six years (Exhibit 1). The landscape has dramatically changed since the last federal health IT strategy. When we released that Plan , the HITECH Act implementation was in its infancy . Since then, there has been remarkable growth in health IT adoption. Additionally, the Affordable Care Act implementation has begun to shift care delivery and reimbursement from fee-for-service to value-based care. A central component of the prior Strategic Plan was increasing the adoption of certified EHR technology among hospitals and professionals eligible for Medicare and Medicaid EHR incentive payments, and encouraging its use in clinical care. While this effort is still incredibly important, our national agenda broadened to improving health, not only health care, through health IT beyond EHRs, as well as leveraging policy and programs beyond the EHR incentive program known as Meaningful Use. Our proposed federal strategy supports this agenda to engender a healthier nation through the collective impact of integral stakeholders, across multiple sectors, using a broader set of technologies. Implementation of the HITECH Act accelerated adoption of certified EHR technology among hospitals and providers that were eligible for incentive payments from Medicare and Medicaid. However, health IT adoption across the care spectrum is far from ubiquitous. Adoption among ineligible providers continues to lag. Federal actions will support health IT adoption among these providers to improve care coordination across settings. Federal actions will also focus on health IT broader than EHRs. Widespread telehealth use can increase care access and improve care quality. Remote monitoring can allow a care team to monitor an individual’s health status while she is in the comfort of her home, improving the individual’s care experience. Mobile health apps can remind an individual to take his medication. Granular information on community health indicators can inform targeted initiatives by innovators from various sectors. Federal agencies must also help create a fertile and competitive marketplace ripe for innovation. Health IT adopters must have the mobility to switch products without fearing the loss of important health information, productivity, or undue financial hardship. Use of health IT should increase patient safety and prevent vexing events from occurring, not the reverse. Technology developers should work with end-users to design more user-friendly health IT, making technology use a more rewarding and effective experience. Complete, timely, and accurate health information across the care continuum can help prevent adverse events from occurring . Unfortunately, widespread exchange remains elusive . We must do better. Secure and interoperable health information is paramount to the goals of care delivery system transformation and improving the nation’s health. This goal aligns with the Nationwide Interoperability Roadmap, a parallel activity led by ONC. 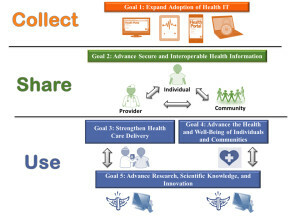 The Roadmap is guiding interoperability solutions based on five key building blocks: core technical standards and functions; certification to support adoption and optimization of health IT products and services; privacy and security protections for health information; a supportive business, clinical, cultural, and regulatory environment; and rules of engagement and governance of health information exchange. Federal strategies will center on creating an infrastructure that encourages interoperable health information regardless of technology developer, platform, location, provider, or other boundaries. It is also essential that federal efforts promote privacy and security protections to support the collection and sharing of interoperable health information , as breaches and illicit disclosure of sensitive information may seriously jeopardize trust in our health care system. The collection and sharing of interoperable health information are prerequisites for using electronic information effectively. Strengthening health care delivery; advancing the health and well-being of individuals and communities; and advancing research, scientific knowledge, and innovation are the Plan’s raisons d’être. This is what we intend to accomplish, in concert with individuals, the private sector, local and regional entities, and as a nation in the next six years. Strengthen Health Care Delivery. The typical Medicare beneficiary receives care from numerous physicians in a given year . This sets the stage for missed care interventions, lack of available health information, and worse health outcomes. Barriers to seamless care coordination include overstressed primary care physicians; financing that rewards the number of services administered rather than outcomes achieved; lack of integrated systems; and the lack of interoperability. To achieve this goal, the Plan features flexible strategies to improve care quality, safety, and outcomes through use of electronic clinical quality improvement tools and measurements, and through supporting health care providers’ adherence to evidence-based guidelines. A key underpinning of this goal is supporting delivery reform by identifying and increasing administrative efficiencies that reduce cost and improve provider and patient experiences. Additionally, this goal focuses on improving preventive services and population health. Federal actions aim to create an environment where providers can conduct analytics to benchmark, trend, and improve outcomes across their patient population. Federal agencies will also work to identify how health IT can help connect individuals and providers to home- and community-based supports, social services, and health education programs. Advance the Health and Well-Being of Individuals and Communities. A connected delivery system can help improve the health of Americans; however, health care accounts for only about 10–20 percent of health outcomes . On a daily basis, most individuals do not interact with the delivery system.Engaged individuals are more likely to be proactive in practicing wellness, prevention, and disease management behaviors. However, most individuals were not offered access to their online medical record in 2013 . The government needs to take steps to empower individuals and families and to engage and integrate them in health management. Our strategy focuses on increasing individuals’ access to their electronic health information and improving their ability to share and use this information. The quantified-self movement views health IT solutions as a key component for basing health choices and actions on personal metrics and goals. Although most Americans track at least one health indicator, the majority of those individuals monitor progress “in their heads”, while few use technology. There is a significant opportunity to engage individuals in their health by using health IT. This goal also focuses on improving community health, long-term service and supports, and home and community-based services. Economic, social, and physical environment have an extensive effect on health . Federal activities will focus on enhancing public health situational awareness with health IT. This will help public health entities assist communities in managing and preventing chronic health conditions and health care-associated infections; it will also help in dealing with urgent threats such as those resulting from natural disasters or disease outbreaks, and promote community well-being and resilience. Advance Research, Scientific Knowledge, and Innovation. Electronic health information will stimulate a new frontier in research, scientific knowledge, and innovation. This information can help us realize immediate benefits of clinical quality improvement, post-market surveillance tracking the effects and use of biopharmacologic drugs and medical devices, and research on prevention diagnosis and treatment of disease and disability. It can help the nation reach some longer-term goals of personalized medicine, distributed analytics, and person-centered outcomes research. It can also lead to substantial cost savings. Federal government actions will be critical to successfully achieving this goal. Private-sector innovators, entrepreneurs, and researchers will benefit from increased access to and usability of high-quality electronic health data, tools, and services. From the internet to GPS and microchips, government investments have spearheaded cutting-edge technological advancements; our strategy identifies vehicles to continue to foster private-sector innovation and solutions through government funding and open-data initiatives. Finally, federal agencies will continue to invest in, disseminate, and translate research on how health IT can improve health outcomes and care delivery. The Federal Health IT Strategic Plan 2015-2020 is more than a static document that meets a statutory requirement. It is a path forward for catalyzing healthier people and communities through information and technology. Federal agencies have numerous levers available to encourage private-sector innovation and advancement. This strategy represents a coordinated and focused effort to empower the unencumbered collection, sharing, and use of interoperable health information to improve health care, individual and community health, and research. Yet the federal agencies cannot and should not work alone to accomplish this Strategic Plan’s goals. We look forward to feedback from our partners and to working with state, local, and tribal governments. Additionally, efforts by front line health care providers, public health agencies, social service organizations, individuals, and other stakeholders are needed so that health IT can enable health for all. Copyright ©2010Health Affairs by Project HOPE – The People-to-People Health Foundation, Inc.